Tom Daley presents an appeal on behalf of The Brain Tumour Charity, which supports people living with a brain tumour as well as funding research into finding a cure. Browse content similar to The Brain Tumour Charity. Check below for episodes and series from the same categories and more! and this is my dad, Rob. there at every event, cheering me on. But most of all, he was my best friend. In 2011, my family's world came crashing down. he was told it had come back and the prognosis was bleak. he vowed he would make it to the Olympic Games in 2012.
when he was just 40 years old. Losing a parent at any age is absolutely devastating. You can feel like you've nowhere to turn. around Britain who've been through the same thing as my family. Right, let's go. Come on, then. I am definitely a busy person. then I'm out walking with my dog, Skye. excruciating headache. Just, like, bang. You know, out of nowhere. I was saying, "Help, something's wrong, but I don't know what." but they were going to send an ambulance, just in case. Angela went along to a local hospital to be checked over. But as time went on, she began to feel worse. I was surrounded by seven doctors, all around my bed. "and we've realised that you're having a brain haemorrhage." And from there, they realised that I had a slow-growing brain tumour. "there'd be far more risks to opening you up and having surgery." that it was actually beginning to grow again. And at that point, my neurosurgeon said, "Now we need to operate." to suddenly not even being able to wash my own hair or put my socks on. and think about the potential symptoms of the past. When I was 14, I struggled a lot with weight and I was very nauseous. Looking back now, I know that nausea is one of the signs and symptoms. Potentially, that was maybe a symptom of the brain tumour. so easily mistaken with those of other illnesses. of brain tumours in babies, children and teenagers. has been halved from more than 13 weeks to just six and a half. her son, Daniel, treated quickly. Daniel was about three when he first became unwell. Prior to that, he'd been a very happy, cheerful little boy. that his personality started to change. He began to have tantrums, being quite grumpy. I dismissed most of the changes as either, "It's just a little bug,"
or "He's just growing up,"
or "It's just him being a normal little boy." and vomiting in the morning on waking. the symptoms of a brain tumour. "and get him checked out, really." and obviously, that really worried Rosie, when they said that. he was showing, and I knew from the HeadSmart campaign. And they immediately sent him for a CT scan. they sat us down and told us what it was. "Oh, it's all going to be fine," to being a complete wreck. and had caused a build-up of fluid on his brain. that might come along in their life and hurt them. there isn't anything you can do to make it better for them. to spot the signs and get their children the treatment they need. And now, the charity wants to do more. pioneering research funded by the Brain Tumour Charity. We know the HeadSmart campaign has been a great success. is going to help us to achieve that. the spectrum of the problem of early diagnosis. Daniel wouldn't be running around, playing with his sisters now. Daniel probably wouldn't be here now. all clear again, they're happy the tumour's not going to come back. So he has basically been given the all clear, really. and they made me better. and together, they hand out cards to local pharmacies and opticians. We got some up-to-date HeadSmart cards. through things like brain tumours. and awareness raising, as well. me and Angela went through. and what the impact would be. Over 100,000 people in Britain live with a brain tumour. And, speaking from first-hand experience, it's devastating. But together, we can defeat the disease. and one day, stop families from wondering, what if? but there are people out there like Angela and Daniel who can. Please help this great charity and donate now. and the whole £10 goes to the Brain Tumour Charity. or to make a donation online, visit the Lifeline website. ..writing "The Brain Tumour Charity" on the back of the envelope. 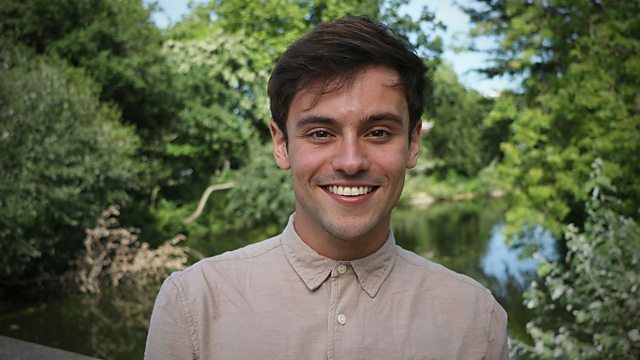 Tom Daley presents an appeal on behalf of The Brain Tumour Charity, which supports people living with a brain tumour and their families, as well as funding research into finding a cure. Tom lost his father Rob to the disease in 2011, and he and his family have been directly supported by the charity. Angela from Northumberland was diagnosed aged just 21. She has since received life-saving surgery to control her tumour and is now a staunch promoter of the HeadSmart campaign, which aims to raise awareness of tumour symptoms in babies, children and teenagers. The campaign saved the life of six-year-old Daniel after his mum Rosie recognised his symptoms from the HeadSmart card.